First volume cover of Billy Bat. Billy Bat (ビリーバット, Birī Batto) is a Japanese seinen manga series written by Naoki Urasawa and Takashi Nagasaki and illustrated by Urasawa. The series was announced in issue 45 of the Japanese manga anthology Weekly Morning in 2008, and its first chapter was released in the next issue of Morning on October 16, 2008 and the last chapter on August 18, 2016. The series was compiled into 20 volumes by Kodansha with the final volume published on September 23, 2016. Volume 1 was the fifth best selling manga volume in its week of release, selling over 145,000 copies in that week. The story begins in 1949 and follows Japanese-American comic book artist Kevin Yamagata as he draws the popular detective series "Billy Bat". When he learns he may have unconsciously copied the character from an image he saw while serving in occupied Japan, he returns to Japan to get permission to use Billy Bat from its original creator. Upon arriving there, however, he becomes embroiled in a web of murder, cover-ups, and prophecy that all leads back to Billy Bat. It is soon evident that the truth of Billy Bat's nature is far larger than Kevin could ever guess, spanning across millennia and the world. Kevin finds that The Bat is related to an ancient scroll which is said to enable anyone who possesses it to rule the world. Kevin Yamagata (ケヴィン・ヤマガタ, Kevin Yamagata) : Kevin Yamagata is the first protagonist of the story in 1949. He is a nisei Japanese-American comic book artist drawing the popular detective series Billy Bat. When he learns he may have unconsciously copied the character from an image he saw while serving in occupied Japan, he returns to Japan to get permission to use Billy Bat from its original creator. Kevin's comics mostly feature anthropomorphized animal characters, such as dogs or mice. Later on, his Billy Bat comics become a kind of prophecy, its various plotlines precisely predicting future world events. Kevin's Japanese name is Kinji Yamagata (山縣 金持, Yamagata Kinji). He is said by others to resemble actor Ryo Ikebe in both looks and personality. He was born and raised in Orange County, California on November 26, 1923, while his parents were both originally from Niigata. Jacky Momochi (ジャッキー・モモチ, Jakkī Momochi) : A nisei Japanese-American University girl in New York who was unwittingly influenced by Billy Bat. She is the descendant of the Momochi Clan of Iga-ryū. She later goes to Japan to uncover the truth about Francis Xavier's first Japanese disciple, Yajirō. Kevin Goodman (ケヴィン・グッドマン, Kevin Guddoman): Tony and Diane's little son and the second protagonist of this story. He plays a role in JFK assassination, where he was saved by Kevin Yamagata from being shot. As a result of Yamagata's actions, the assassin's bullet hit and killed JFK instead. Like other characters, the boy can also see the Bat and his scribblings reveal insight into the future JFK Assassination and the Momochi Clan's connection to the Scroll. He eventually grew up and his adventure begins in 1981 during his days as a university student of Princeton, New Jersey. Agent Smith (スミス, Sumisu): A mysterious man who claims to work for the CIA, and is investigating the Shimoyama incident. He helps Kevin investigate the myth of the Bat. While trying to save Kevin from an unknown assassin, he disappears. He reappears in 1981, elderly, and missing his left eye, saving Kevin Goodman from a fake police officer that was about to shoot Kevin. Kiyoshi Kurusu (来栖 清志, Kurusu Kiyoshi): A mysterious character working for a company called East Asian Industries. He is Finney's rival in the search for the legendary Scroll of Momochi. He and Finney presumably are the masterminds behind both the Shimoyama incident and the JFK Assassination, though it is later clarified they both work for rival organizations who want the scroll for themselves. In Zōfū's manga, he makes an appearance as the character Karate Chop Man. He is seen again in 1981, with even Billy Bat mentioning he is unsure of Kurusu's full role in the scheme of things. It revealed Kiyoshi once meet Zofu as a child after the death of his father. Captain Finney (フィニー大尉, Finī Taii) : A portly, pale-eyed man who claims to work with the GHQ Special Investigation Unit. He and Kurusu are searching for the Scroll of Momochi. By the 1960s, he has apparently begun working for the fake Chuck Culkin. Timmy Charles Sanada (ティミー・チャールズ・サナダ, Timī Chāruzu Sanada): The illegitimate son of the fake Chuck Culkin, and chose by Kevin Goodman to be his successor. It is later revealed the "voice" he hears isn't Billy, but the delusions of his father, guiding him to the end of the world. He soon usurps control of Chuck Culkin Enterprises. Billy Bat (ビリーバット, Birī Batto): Ostensibly, a talking anthropomorphic bat that is the star of several detective comic book series throughout the 20th Century. His true nature and purpose comprise the central mystery of the plot. Francis Xavier himself once mentioned the Bat, unsure if the entity was an angel, demon or perhaps both. Zōfū, on the other hands, claims there are two bats, one white and the other black. When The White Bat appears, it always says confusing things, and when The Black Bat appears, it manipulates people to do bad things; however, Albert Einstein later states that the White Bat is not to be trusted, and will destroy all who it "helps". Chuck Culkin (チャック・カルキン, Chakku Karukin): Kevin Yamagata's assistant in 1949. He was left in charge of drawing the Billy Bat series when Kevin left for Japan. "Chuck Culkin" (「チャック・カルキン」, "Chakku Karukin"): An imposter who has taken on the public persona of Chuck Culkin, and is the head of Chuck Culkin Enterprises, the company that owns the rights to Billy Bat. He has the real Chuck Culkin cooped up in his mansion, producing new Billy Bat comics that prove explosively popular. He bears similarity to Walt Disney, both in appearance and personality. A former Nazi soldier, he was personally tasked with traveling to the United States and popularizing the image of Billy Bat by Adolf Hitler. Charlie Ishizuka (チャーリー・イシヅカ, Chārī Ishizuka): A Japanese man who works for GHQ, acting as an interpreter for L.T. Colonel Chagnon of the Civil Transportation Section (CTS) who was Kevin's longtime friend. He owned a copy of the Scroll made by Hattori Hanzo, but after he is found dead the ancient text went missing. Shizuka (シヅカ, Shizuka): A Japanese prostitute who fell in love with Kevin and sheltered him when he was first pursued by Kurusu. She was injured as a result of the scuffle and was rendered unable to work for a time. When she finally did start working again, she was fatally wounded by someone she called the Karate Chop Man, and died in Kevin's arms. Zōfū Karama (唐麻 雑風, Karama Zōfū): A Japanese manga artist who has been drawing the Billy Bat character (in his "Boy Bat" incarnation) since the Taishō period. Bears similarity to Shichima Sakai, the mentor of Osamu Tezuka. Tony and Diane Goodman (トニーとダイアン・グッドマン, Tonī to Daian Guddoman): A married mixed-race American couple. Tony is the caucasian heir to the Golden Cola Company, and Diane is a black worker at the facility Tony supervised. They fell in love, but the objections of both of their families forced Diane to run away from the wedding. During her flight, Diane rode a taxi driven by Randy Momochi, and their subsequent conversation convinced Diane not to give up on her marriage. Tony is a major fan of Kevin's version of the Billy Bat comics, and the couple named their first son Kevin as a result. Randy Momochi (ランディ・モモチ, Randi Momochi):An issei Japanese-American cabbie in New York, he helped reunite Tony and Diane on their wedding day. A fan of Kevin Yamagata's Billy Bat series, he is also Jacky Momochi's father. His Japanese name is Kinji Momochi (百地 金持, Momochi Kinji). Kanbei (勘兵衛): A ninja of the ancient province of Iga who served the Momochi Clan. When the land of Iga was attacked by Oda Nobunaga's army, he was ordered to bring the Scroll to Momochi Sandayū. To accomplish his mission, he was forced to kill his childhood friends. Later, he met the original owner of the scroll, Yajirō, Francis Xavier's disciple. Shortly afterward, Yajirō was killed, and out of remorse for the murders he committed, Kanbei decided to bury the Scroll in order to hide it from Momochi Sandayū. Henry Charles Devivie (ヘンリー・チャールズ・デヴィヴィ, Henrī Chāruzu Devivi): A mysterious man who wants to buy Koumori Village, the town where the Scroll is said to be located, in order to make a new Billy Bat theme park. His true goal, however, is to find the Scroll, and anyone he decides to negotiate with about the land soon ends up murdered. Kotarou Akechi (明智 浩太郎, Akechi Kōtarō): A famous Japanese movie director specializing in special effects and monster movies. Famous for his movie "Great Monster Gazura", the equivalent of Godzilla in the world of "Billy Bat". Likewise, his appearance is reminiscent of Ishirō Honda, the most famous director of the Gojira franchise. He is summoned to America by Chuck Culkin Enterprises to direct a faked landing on the Moon. Shishou (師匠, Shishō) (Master): A lumbering Japanese American ex-con and artist who, like Kevin and Zōfū, predicted the future through his comic strips. Audrey Culkin (オードリー・カルキン, Ōdorī Karukin): The apparent daughter of the fake Chuck Culkin, she first appears as an "art dealer" trying to recruit Kevin Goodman. Maggie Momochi (マギー・モモチ, Magī Momochi): Jacky's daughter, she is an aspiring documentary filmmaker in 2017. Sadanori Shimoyama (下山 定則, Shimoyama Sadanori): Bureaucrat of Ministry of Transport (former Ministry of Railways), was appointed the first president of JNR when it was established on June 1, 1949. Under the Dodge Line policy of the government, Shimoyama was responsible for drastic personnel cutbacks of JNR, as a part of which on July 4, 1949 he released a list of about 30,000 employees to be fired. Jirō Shirasu (白洲 次郎, Shirasu Jirō): Japanese diplomat and politician who served as interpreter and negotiator in the talks between the Japanese government and Douglas MacArthur's GHQ, on account of his education in Cambridge. In the manga, Shirasu is a mysterious character who helps Kevin in one occasion. Judas Iscariot: One of the twelve apostles of Jesus, best known for betraying Jesus. He sees Jesus heal someone, asks him if he was "the appointed one", then asked him "if you've seen God before, what is his shape?". Jesus then drew the Billy Bat symbol. Francis Xavier: (7 April 1506, Javier, Navarre (Spain) – 3 December 1552, Shangchuan Island, China). He led an extensive mission into Asia. At age 10 he became the carrier of the "Ancient Text" until his death. Lee Harvey Oswald: (October 18, 1939 – November 24, 1963) was, according to four government investigations, the assassin of President of the United States John F. Kennedy, who was fatally shot in Dallas, Texas on November 22, 1963. When working at "Billy Land" he had a vision of the Bat asking him if he wanted to be "the country's next hero." The Bat ordered him to protect Kevin for the sake of mankind. Later in JFK Assassination he actually wasn't the murderer. At the time JFK was shot he was at the library building with Jackie, but in the end he accepted his fate as the scapegoat instead. An old province of Japan in the area that is today western Mie Prefecture. It is particularly famous for its clan of ninja. Both the Iga and Kōka provinces are considered the birthplace of ninjutsu. It was also the birthplace of haiku poet Matsuo Bashō. It is said that Iga was controlled by three ninja families; Hattori controlled the middle, Fujibayashi the north, and Momochi the south. Nagato was a ninja jonin active around the same period as Momochi Sandayu. He worked quite a distance away from the main area of Momochi Sandayu's activities (North Iga as opposed to Momochi at the South), and was feared almost as much. However, it is believed that Momochi Sandayu and Fujibayahi Nagato were, in fact, the same person, as Momochi Sandayu was mentioned in a journal describing Oda Nobunaga's invasion of Iga province in 1581 for his courage and gallantry, but there is no mention of Fujibayashi Nagato. Arguably the most famous ninja in history, the tales of Hattori Hanzō are still told in Japanese History books. He sent Gonosuke to kill Kanbei and retrieve the scroll. When Iga is attacked by Oda's army, he allowed Kanbei to bury the ancient scroll and chose not to kill him because he already made a copy of the ancient scroll and passes it to Akechi Mitsuhide. In 1581, two years after a failed invasion led by his son, the warlord Oda Nobunaga launched a massive invasion of Iga, attacking from six directions with a force of 40,000 to 60,000 men. After ruthlessly slaughtering great numbers of the inhabitants of the Iga region, Oda Nobunaga then declared a cease-fire which allowed some of the Iga ninja to escape. It was, however, the end of the independent Iga Republic. (April 17, 1911 – March 29, 1977) was a petroleum geologist and Professor who befriended Lee Harvey Oswald in the summer of 1962 and maintained that friendship until Oswald's death two days after the assassination of U.S. President John F. Kennedy. He had personal acquaintance with the Bouvier family, including Jacqueline Bouvier Kennedy, the president's wife, when she was still a child. (May 29, 1917 – November 22, 1963), often referred to by his initials JFK, was the 35th President of the United States until his assassination in 1963. There is a mystery surrounding his death. The first person to set foot upon the Moon. He discovered Bat Symbol on there. The famous scientist who developed Relativity Theory. During his visit to Japan in 1922 he met Zofu Sensei and it seems he also has met with The Bat and said something horrible will happen and to abandon such things called time travel to Zofu Sensei; this probably gives speculation that The Bat has the ability to manipulate time. (20 April 1889 – 30 April 1945), Leader of Nazi Germany in the lead-up to and during World War II. He appears choosing the fake Chuck Culkin to use the image of Billy Bat to become the most powerful man in the world. 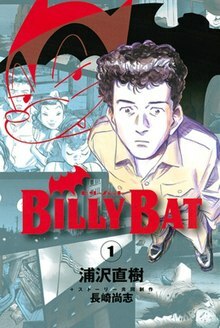 ^ a b "20th Century Boys' Urasawa to Launch Billy Bat Manga". Anime News Network. October 8, 2008. Retrieved July 6, 2009. ^ "Japanese Comic Ranking, June 22–28". Anime News Network. July 1, 2009. Retrieved July 6, 2009. This page was last edited on 19 November 2018, at 15:40 (UTC).